Anywhere Deck Chairs 2014 What a Year- Part One! Home » History and Stories » Anywhere Deck Chairs 2014 What a Year- Part One! Following on from our first job at London zoo, the enquiries for Anywhere Deck Chairs kept on coming. There were so many highlights throughout the year, it truly has been amazing. 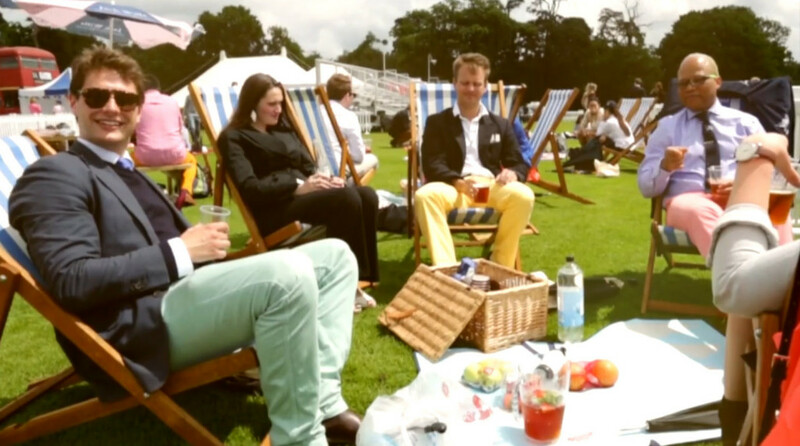 The Jack Wills event at the Guards Polo Club in Great Windsor Park was particularly memorable. We turned up on a beautiful sunny day at this wonderful venue to find a big red London bus converted into a bar! It fitted in so well with the surroundings and the deckchairs complimented the whole look. We were even lucky enough to be featured in Jack Wills video of the event. Dorney Lake was another beautiful venue for our clients, BBC Worldwide. The event was a triathlon organised by Human Race Events. We were more than happy to watch the competitors arrive whilst setting up rather than take part! In June we delivered 100 deckchairs to Wembley Arena. Driving up and placing our Anywhere Deck Chairs in front of this iconic stadium really took our breath away. Shoppers and staff were able to sit and watch Wimbledon on the big screen outside for two weeks and thankfully the great British weather did not let us down on this occasion…..Unfortunately this was not the case for the Ride London event set over two venues, Dorking Town Centre and Denbies Wine Estate. Luckily for us this did not put the organisers off and we have been booked in again for 2015. The summer brought us some bookings for weddings. We met such lovely brides and grooms and were pleased that they had chosen Anywhere Deck Chairs to be part of their special day. A garden setting in Sway, in the New Forest gave us an insight in how the deckchairs can be used alongside tipis and gazebos as an alternative to hiring out a venue. If you would like information on hiring our traditional deckchairs contact us for details.